March is National Reading Month. Why not celebrate the joy of children's literature with a kids' storybook craft party? I learned as a special education Montessori teacher/homeschool mom to make lesson plans hands-on. So my craft parties include an interactive story and snack. One of my husband's favorite children's literature characters is Harry the Dog, created by Gene Zion and drawn by Margaret Bloy Graham. 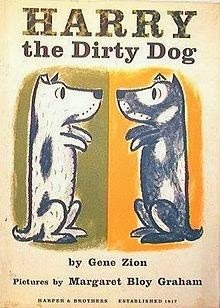 Harry the Dirty Dog won the Caldecott Award for children's literature illustrations. Here are free printable lesson plans, book crafts and recipes for a Harry the Dirty Dog party. Most of the activities come from the book No Roses for Harry. Read Harry the Dirty Dog and No Roses for Harry. Stop at different points in the stories and have children predict what will happen next. Make flip books by cutting plain paper in quarters and staple together. Let children illustrate the books and tell the story using flip books. Use these free printable Harry the Dirty Dog lesson plans. Make a booklet of free printable Harry the Dirty Dog activities.Use these free printable Harry the Dirty Dog coloring pages for kids to color while you read stories. Here are some free printable children's literature coloring pages from No Roses for Harry. Make a yarn bush book crafts for the birds based on No Roses for Harry. Have kids gather up recycled bits of string and yarn. Place them in trees and bushes for the birds to use in nest building. Look for your yarn in bird's nests. My mother made a yarn tree and said she knows the birds are using it because the yarn is disappearing. You might get a bird guide and ID the birds you see in the yard. Teach kids to braid yarn or strips of scrap fabric. Twist braided yarn into a flat coil and sew together in several places. Make into pot holders or mug rugs for book crafts. For Harry the Dirty Dog snacks, make scrubbing brush cookies. Use spray decorator frosting to make brush bristles on Nutter Butter peanut butter sandwich cookies. For No Roses for Harry, make Polish "roses." Spread cream cheese on a scallion. Wrap a slice of ham around it. Make No Roses for Harry rose pinwheel cookies. Roll sugar cookie dough into "snakes" then roll in red sprinkles. Wind into a pinwheel and bake. Or make flower cookies. Roll sugar cookie dough in little balls. Arrange four in a square. Bake and frost. Decorate with candy sprinkles and an M&M in the center. Here are value-added children's literature book crafts plus snacks! Enjoy Harry the Dirty Dog drinks--chocolate milk and white milk--while making your book crafts. Read the rest of the Harry the Dirty Dog children's literature series including Harry and the Lady Next Door and Harry By the Sea.